Homemade chicken pot pie-the ultimate comfort food! Place pie dough into 2 (9-inch) pie pans or 1 (9-by-13-inch) baking dish. Set aside. Remove turkey from turkey legs, and set aside. Preheat oven to 375 degrees. Melt butter in heavy dutch oven and sautee leek, onion, potatoes and carrots until tender. Add mushrooms, and cook about 2 minutes. Sprinkle flour over vegetables. Slowly add chicken broth, and cook a few minutes or until thickened. Stir in turkey, parsley, seasoning and thyme. Remove from heat, and slowly add heavy cream, stirring to combine. Add salt and pepper, to taste. Pour filling into baking dish or pie pans. Roll out pastry to fit top of each pie, then place over filling. Trim, seal and flute edges. Cut out a decorative center or cut slits in pastry. Whisk together egg and 1 tablespoon water, then brush over top of piecrust. Bake at 375 degrees 45 to 50 minutes or until golden brown. Let stand 15 minutes before slicing. 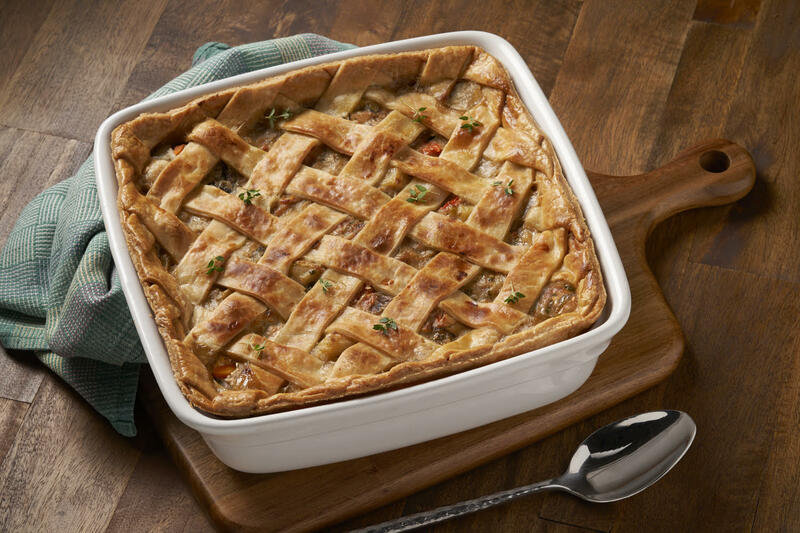 Option to freeze: Cover and freeze unbaked potpies up to three months. To use, remove from freezer 30 minutes before baking (do not thaw). Preheat oven to 425 degrees. Place pie on a baking sheet, cover edge loosely with foil. Bake 30 minutes. Reduce oven setting to 350 degrees, remove foil, then bake 55 to 60 minutes longer or until golden brown and a thermometer inserted in center reads 165 degrees.